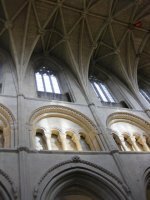 The narrative and poems on belief in the book It’s OK to Believe take the reader on the author's journey to unite her questioning mind with her faith. This is no dogma or doctrine but a personal spiritual journey. 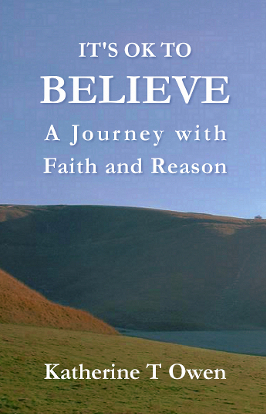 The book serves as a thought-provoking and poetic guide to allow the reader to ask and answer their own questions of faith and clarify their own beliefs through comparison with Katherine's own journey and findings. "I am grateful for this book. It is bright with healing and freedom. I know that many who read it around the world will find an open door of permission to explore the infinite possibilities of grace and God in new ways. I hear the musical clank of chains falling to the ground and a chorus of liberated laughter rising loud from the souls of humanity everywhere. Thanks to Katherine T Owen for inquiring so deeply into the nature of Life– for asking questions with her own experience which many are too afraid to consider. This author is herself a refrain of the great glad tidings resounding in our ears from All That Is. She brings to mind the words of Hafiz: "I am a hole in a flute that the Christ's breath moves through ~ listen to this music”." Click to buy It's OK to Believe. “Do you want to view reality from a fresh perspective? Out of 250 authors going through out of the original 3000 in the Next Top Spiritual Author Competition, Joanne chose five to promote only 5 books. I was honoured that It's OK to Believe was amongst them. "Unique. That's what I'd go with. Her voice and life story are so compelling, it's hard to come up with comparisons. Katherine could have gone the memoir route and simply told the extraordinary healing journey she's made for body, mind, and soul during a 14-year virtually immobilized illness challenge that most of us could never imagine. But, no. Instead, she just tells us it's OK to believe, in the things we can see, and in the things we cannot see. That would seem to take up only a simple sentence, but not so. Through a blend of narrative poems, release statements, and quotes from the Bible and A Course in Miracles, Katherine blows right past your mind and into your soul, which starts saying "Yes!" right away. The resonance was immediate." . The only comparison that came to mind from the first poem was of Khalil Gibran. A gentleness with ancient text-like authority, perhaps due to the biblical and ACIM influences. Joanne Sprott is a spoken-word poet and essayist on spiritual topics. She hosts the radio show Beyond Words on BelieveInTheMoment. “I keep a copy of 'It's OK to Believe' beside my bed to end the day. I like the style - very direct and simple whilst containing well thought through content. It is always apposite, always uplifting. “It's OK to think life has no meaning”. I don't know why but that release makes me feel very emotional. “I have a sense of you being on a journey and I am going with you, asking questions and looking for answers. "I have been asking spirit vehemently for days to send me the answer to something I have been trying to figure out. Last night they told me guidance would be coming in human and spirit form. This morning, I was so tired from frustration I took the kids to school and went back to bed. I never answer the door when I am asleep, nor my landline but keep my mobile next to me as an alarm. My stepfather rang me and woke me up, asking if I would be practicing later. I said yes and was about to go back to sleep when I had a strong sensation I was being woken up for something else. One minute later someone knocked on the door and your book turned up. Thank you so much for writing the book. I think there will be many more things in there I haven't yet thought of! PS. 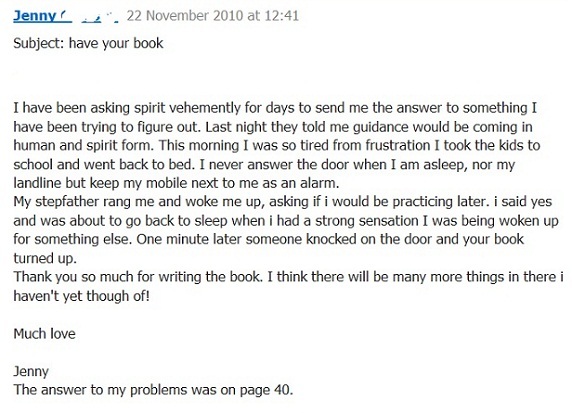 The answer to my problems was on page 40." “The one page format embracing poem, release and spiritual quotation and preceding explanatory notes enables a quality of focus, encouraging one to turn the corner of a page that ‘speaks’. The excellent text combines depth of content with accessibility; it is relevant to both experienced Christians and those people who are responding to the innate need in all of us to seek. Having read your wonderful book, It's OK to Believe, I have to say that I am surprised how much I enjoyed it. 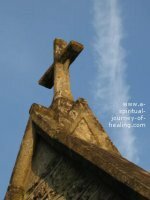 “It's OK to Believe has inspired me to trust my own creative way in conjunction with ACIM. I like the way the book delightfully 'lightens the way and brings in the permission for things to be as they are". A great book to have by my bedside. 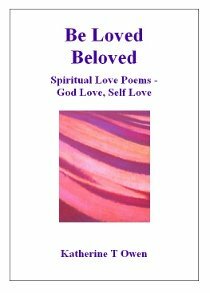 Move from Poems on Belief to read a sample of spiritual poetry from It's OK to Believe. Read more about the book It's OK to Believe.